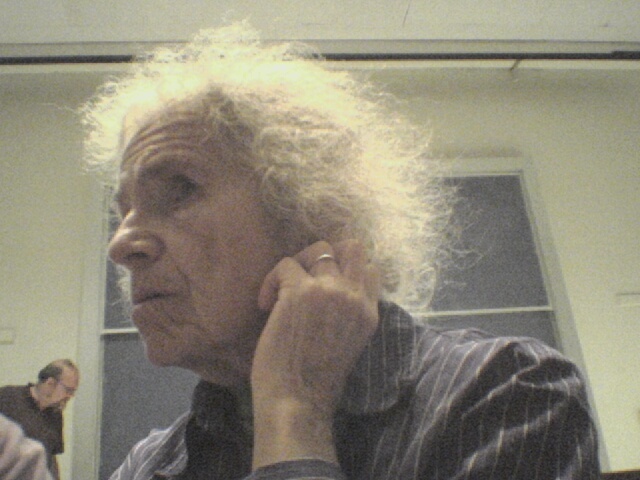 An article by Brenda D. Frink. Click on picture to read article. productive + procrastination = productination: a collection of links about humor to spend your time not working in a semi-productive manner. Anyone want to blog on Two and a Half Men? Feel free to send me articles or to post them in the comments. If incongruity is at the heart of humor and what makes people laugh, as some theorists have maintained, then nowhere is there a greater disparity between the ideal and the real, between the dream and our failure to achieve it, than in American politics. A gauge of the success of our system is our willingness to make fun of ourselves and celebrate our failures with the horse laugh. We hold nothing above ridicule—the law, government, religion, or the President—and we seek redress through satire. Rather than be discouraged, the use of humor encourages us to try again and see if we can’t get it right the next time. Laughter is a healthy corrective, and it serves to adjust our hopes and expectations to the reality of what’s actually possible in this increasingly precarious world. Little wonder then that the editorial or political cartoon has been a mainstay in the media of this country from its very founding. One of the earliest political cartoons to appear in a newspaper was attributed to Benjamin Franklin in the May 9, 1754 issue of the Pennsylvania Gazette. 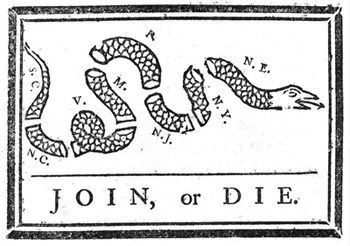 The crude drawing portrayed a snake cut into separate portions like the states, with the injunction “Unite, or Die,” a warning that political survival in the colonies depended on union and mutual respect. Not much humor there really, except in the odd choice of the snake, given all its symbolic weight, as the image of the emerging nation. We would not have truly belletristic writing in America until Washington Irving and James Fenimore Cooper several decades after the founding of the nation. One reason for this may have been the fact that the minds of the leading intellectuals were mainly involved in working out the details of the social and political structure of the commonwealth. Most of the writing, therefore, addressed practical economic and political problems, as well as theological questions. There did seem to be room for humor however. As early as 1647 Nathaniel Ward ridiculed what he saw as too much religious tolerance and freedom for women in the colonies in The Simple Cobler of Aggawam. Almost a century later, Thomas Morton, of Maypole fame, turned the spyglass around in the other direction and made fun of Puritan bigotry in New English Canaan (1737). Ebenezer Cooke in Maryland laid a comic Hudibrastic curse on the entire new world in The Sot-Weed Factor (1708). As periodicals and newspapers developed, the columns were promptly filled with humorous essays and satires on the absurdities and pomposities of the emerging social and political classes. Franklin, the Connecticut Wits, Hugh Henry Breckenridge, Seba Smith, Francis Whitcher, and Marietta Holley were among them, the last two women also having their say. Soon major schools of humor would emerge in New England and the Old South, which would in turn produce Mark Twain, after whom neither American literature nor humor would ever be the same. As for political humor, do we have a more profound and funnier statement on the conflict between the individual conscience and the laws of the state than Adventures of Huckleberry Finn (1885)? The example of Twain’s comic accomplishments would inspire many other writers to follow, such as James Thurber, Dorothy Parker, Langston Hughes, William Faulkner, Woody Allen, and Garrison Keillor, to name only a few. A strong strain of humor has persisted in American literature. But just as surely as these writers were observing and commenting on the national scene and the human condition, so too were the editorial cartoonists in the pages of the newspapers. Although Franklin and Paul Revere are credited with early political cartoons, it wasn’t until Thomas Nast and Joseph Keppler in the nineteenth century that they became a major force. Nast’s satiric vision was so penetrating and influential that his cartoons seemed to have an effect on national affairs. One of his Civil War drawings is credited with assuring Abraham Lincoln’s re-election in 1864, and his unrelenting attacks on Boss Tweed and his Tammany Hall cronies contributed to his downfall and imprisonment. Although few would have such direct influence, many notable comic artists would follow Tweed’s path into political cartooning as a profession, such as Rollin Kirby, Jay “Ding” Darling, Herbert L. Block (Herblock), Bill Mauldin, Patrick Oliphant, Paul Conrad, and Jeff MacNelly. Do readers pay attention? Sometimes with startling results. While mostly readers respond with letters of complaint, in 1987 a reader was so incensed with a cartoon by Tony Auth in the Philadelphia Inquirer that he broke into his office, trashed it, and warned that if it wasn’t for his religion and humanity, he would have killed the cartoonist. More recently, in the January 29, 2006 issue of the Washington Post, a cartoon by Tom Toles criticized statements about the war in Iraq by Defense Secretary Donald Rumsfeld through use of a symbolic figure of an American soldier who has lost both arms and legs. On the same day as the cartoon by Toles appeared in the Post, the pages of the newspaper carried the first story about what would prove to be the most profound and powerful response to a cartoon in history, what has become known as the Danish cartoon incident. A daily Danish newspaper had published on September 30, 2005, twelve cartoons criticizing Islam and the Prophet Muhammad as a test of freedom of speech, the editor understanding that Islamic tradition forbade any pictorial portrayal of the prophet as a hedge against idolatry. He may also have understood that any ridiculing of the prophet, as had been demonstrated by Salman Rushdie’s lampoon of him in Satanic Verses, would constitute blasphemy deserving of the death sentence. Protests, demands for an apology from the editor and the Danish government, and legal complaints were lodged for a year by Muslim groups before it erupted into an international furor. Danish embassies were closed in Muslim countries, boycotts against Danish trade and products were instituted, and riots broke out in several countries leaving many injured and a considerable number dead. Editors in the United States and abroad who chose to reprint the cartoons were accused of inciting further violence, while those who did not were condemned for giving in to repressive pressure to gag freedom of speech. A few resigned or lost their jobs. One of Charlie Chaplin’s more famous routines is the table ballet scene from the The Gold Rush from 1925 (linked above). However, my first exposure to the scene was from a small film with a young aspiring actor Johnny Depp. He had recently gotten a lot of good press for “Edward Scissorhands” (for which he was nominated for a Golden Globe) and “What’s Eating Gilbert Grape.” I was a young impressionable 23 year old and I loved “What’s Eating Gilbert Grape.” However, I really loved the goofiness of 1993’s “Benny & Joon” (clip linked below), yes goofiness. I don’t know another word for it. I’ve always loved Depp’s eccentricity. It is a certain something that does remind me of Chaplin however being a cultural critic there are somethings that as an audience strike us very differently. These scenes deserve a closer look. Next week I will follow up with a comparison. I invite readers to do the same. Two of the most exciting things to come out of the Internet this year were the personal archives of Jerry Seinfeld and the addition of the Comedy Genome Project to Pandora’s music collection. Seinfeld launched his archive to mark the 30th anniversary of his first national broadcast spot. Each day, the site features three different clips spanning the length of his career, ranging from desk pieces on various late night shows to short stand-up bits from various appearances and Seinfeld (watch as his accent disappears over time). Right around the same time, Pandora responded to listener requests and created a station featuring 10,000 clips from over 700 comedians. The clips are organized into categories, allowing a listener to select one style and (presumably) avoid another. These categories, of course, are a little reductive and deserve to be complicated—titles like “Urban Comedy” are problematic, and the separation of, say, “Comedy Icons” from “Working Class Comedy” gives pause. I wonder how these classifications sit with the performers, and how many people who opt out of the “Raw Comedy” library will then miss out on a good Louis C.K. bit. Is it advantageous for performers to jockey for position within a more ‘mainstream’ category with wide appeal (surely, C.K. belongs in “Comedy Icons”) like films trying to avoid an NC-17 rating? Or is this small potatoes in terms of exposure? That all depends on who is listening, I suppose. Those who count themselves among the initiated might either press on despite warnings of foul language or walk away knowing what they are missing. But if people who listen to comedy somewhat less obsessively are getting a skewed perception of the field based on Pandora’s classificatory criteria, it seems a revision would eventually be in order. Opening this week: a new exhibition at the Hollywood Museum, “Lucille Ball at 100 & ‘I Love Lucy’ at 60,” which will be on display from Aug. 3 to Nov. 30, showcasing memorabilia saluting the careers and romance of Hollywood’s most famous lovebirds. If anyone visits either the Hollywood Museum exhibit or the Center for Comedy and would like to write a review, please let me know: wustert@gmail.com.